Solubilized proteins from PC12 membranes. Purity Purified from cultured hybridoma medium on immobilized rProtein G.
Specificity 192-IgG reacts with rat p75NTR. It does not cross-react with p75NTR of human or mouse origin. Reconstitution 10 μl, 50 μl, 100 μl or 250 μl double distilled water (DDW), depending on the sample size. 1. Mouse Anti-Rat p75 NGF Receptor (extracellular) Antibody (#AN-170), (1:2500). 2. Mouse Anti-Rat p75 NGF Receptor (extracellular) Antibody (1:1500). 3. Mouse Anti-Rat p75 NGF Receptor (extracellular) Antibody (1:150). Dechant, G. et al. (1997) Curr. Opin. Neurobiol. 7, 413. Cosgaya, J.M. et al. (2002) J. Science 298, 1245. Yamashita, T. et al. (2003) Nature Neurosci. 6, 461. Bentley, C.A. et al. (2000) J. Neurosci. 20, 7706. Bibel, M. et al. (2000) Genes Dev. 14, 2919. Salehi, A.H. et al. (2002) J. Biol. Chem. 277, 48043. Casademunt, E. et al. (1999) EMBO J. 18, 6050. Yaar, M. et al. (1997) J. Clin. Invest. 100, 2333.
p75NTR known as a cell surface receptor for NGF, BDNF, NT-3 and NT-4, is also a receptor for b-amyloid, and for the myelin axon repellant protein MAG.1,2,4,6 Binding of neurotrophins induces receptor dimerization followed by phosphorylation of receptor kinase residues and recruitment of intracellular proteins involved in signal transduction. 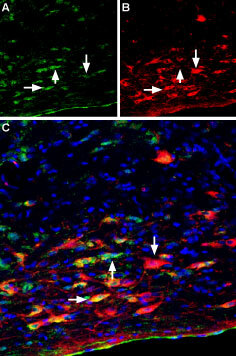 Immuno-colocalization of Vesicular Acetylcholine Transporter and p75NTR in rat medial septum.Immunohistochemical staining of immersion-fixed, free floating rat brain frozen sections using rabbit Anti-Vesicular Acetylcholine Transporter (VAChT) Antibody (#ACT-003), (1:200) and Mouse Anti-Rat p75 NGF Receptor (extracellular) Antibody (#AN-170), (1:200). 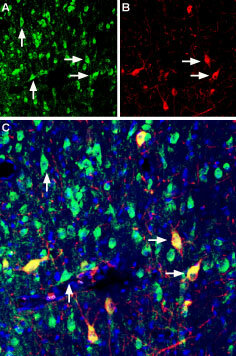 A. VAChT staining (green) appears in several neuronal cells. B. p75NTR (red) also stains neuronal cells. C. Merge of the two images shows colocalization of VAChT and p75NTR in some cells (horizontal arrows), while other cells express only VAChT (vertical arrows). Cell nuclei are stained with DAPI (blue). Mouse Anti-Rat p75 NGF Receptor (extracellular) Antibody (#AN-170) is a highly specific monoclonal antibody directed against p75NTR. The antibody can be used in western blot, immunohistochemistry, and indirect flow cytometry applications. It has been designed to recognize p75NTR from rat samples only. Urra, S. et al. (2007) J. Biol. Chem. 282, 7606. Tan, J. et al. (2006) Am. J. Pathol. 169, 528. Kuwako, K. et al. (2005) J. Neurosci. 25, 7090. Tcherpakov, M. et al. (2002) J. Biol. Chem. 277, 49101. Anti-p75 NGF Receptor (extracellular) Antibody (#ANT-007). This antibody recognizes a different epitope and thus can also be used as a control for detecting p75NTR. Anti-p75 NGF Receptor (extracellular)-ATTO-488 Antibody (#ANT-007-AG). A fluorescent labeled primary antibody. It can be used in immuno-colocalization studies in conjunction with any of our antibodies raised in rabbit. Anti-p75 NGF Receptor (extracellular) Antibody (#ANT-007) recognizes an extracellular epitope and can be used to detect p75NTR in live cells. Anti-p75 NGF Receptor (extracellular)-ATTO-488 Antibody (#ANT-007-AG). This antibody is the conjugated version of #ANT-007 and can be used to detect p75NTR in live cells.